A smile says many things about an individual, but when mouth discomfort caused by a gum cyst is present, it is difficult to smile. When left untreated, they can grow in size, create more pain and make normal oral hygiene care much more complicated. 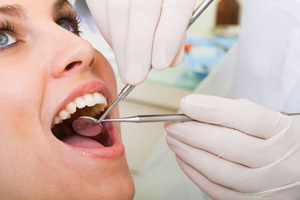 Any type of cyst or abscess in the mouth is generally caused when tooth decay or infection is present. The cyst forms as a defensive mechanism when the body, attempting to keep the invading bacteria or microorganisms isolated, will contain the bacteria in a neat package and thereby forbid them from affecting the rest of the body. When the exterior of the gum tissue is affected, the cyst is referred to as a gingival abscess, and when the cysts extend deeper into the soft gum tissue pockets, they are called periodontal abscesses. A cyst can be either acute or chronic. In many instances, the presence of a gum cyst causes no discomfort. This may be due to the fact that the cyst if very small or, in the case of a periodontal abscess, may be contained within a granuloma or fibrous sac. Chronic abscesses can often be painless, while acute abscesses are frequently identified by their tendencies for swelling, pain and accompanied by fever. For many individuals, a cyst is discovered when a dull pain begins in the gum; accelerating to a continuous aching pain. If the tooth affected by the cyst is touched, immediate discomfort is felt. Extreme food or drink temperatures can also create soreness. Swelling in the area of the affected tooth could develop and the cyst could periodically drain into the mouth, with a bitter taste indicative of the drainage. Other cysts are not discovered until an oral examination is performed, when the presence of the abscess is found using dental x-rays. This is common with periodontal abscesses, which can continue to grow within the depths of the gum in a fibrous sac. The granuloma isolates the infection from nerves which could cause pain. The first step the dental professional will make toward treating the gum cyst is identifying its type. The accumulated pus within the abscess will be surgically drained, and usually antibiotics are prescribed, especially when the symptoms of fever and glandular swelling are evident. Infections occurring within the mouth will often directly affect the lymph glands in the neck as well. When the cyst is identified as a periodontal abscess, the gum pocket where the abscess formed will need to be thoroughly cleaned. After clearing the gum area of infection, dentists will generally recommend that a pain reliever such as aspirin or an acetaminophen be taken to relieve gum soreness and general mouth discomfort. A warm compress can also be helpful. Until the gum begins to heal, a diet consisting of soft foods will be advisable to avoid irritating the area further, and avoiding extreme temperatures of food and drink can help. An area such as the mouth that is warm, moist and dark is the ideal habitat for bacteria. While not all bacteria are harmful and certain ones can indeed be beneficial, it is impossible to determine one from the other. Of course, it is always strongly recommended to maintain a good oral hygiene routine throughout life. Regular brushing and flossing, along with scheduled visits to your dentist, will help to eliminate most issues that will result in oral problems. To greet others with a welcoming smile is not just a gift to them, but a gift of good feeling that you give yourself. Keeping your smile the best it can be by keeping your mouth healthy is the best way you can give the gift of yourself.